The text in the box below is from a letter written to the Premier and Ministers of Natural Resources and Environment in 2014. I understand that the government is committed to the target of reducing clearcutting to 50% of all harvesting, a goal set in 2010 that received all party support and wide public support in Nova Scotia. That support reflects a broader understanding and appreciation of Nova Scotians of the role of older growth forests and multi-aged stand management for biodiversity conservation, protection of water resources and carbon sequestration. 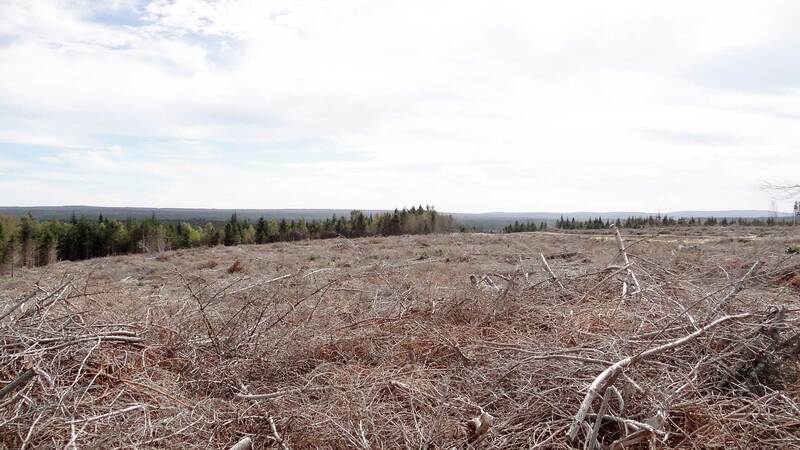 In Nova Scotia, a clearcut is now defined as a forest harvest where less than 60% of the area is sufficiently occupied with trees taller than 1.3 meters with links to [Clearcut Definition] [Clearcut FAQs] providing more details. However this definition is simply not consistent with the broadly accepted objectives of reducing clearcutting/promoting multiage management, and lacks both professional and public credibility. The rationalization cites “the potential of saplings” noting that “immature trees exceeding 1.3 metres tall are considered saplings … They have distinct visual and ecological impacts on harvest areas beyond what is produced by seedlings.” This is very different from multiage management and the benefits it offers for biodiversity conservation, watershed protection and long term productivity. The best that can be offered in support of the definition is that “protection of sapling sized trees during harvesting has a significant potential to reduce future forest rotation lengths” – hardly a factor that increases sustainability in an ecological context! What’s wrong with the definition? First, let’s look at the context. The government promised to reduce clearcutting to 50% of all harvesting. So, half of all cutting can still level the forest to the ground, clearcut and whole-tree harvested, leaving nothing but ruts, exposed soil and the occasional “wildlife clump” of trees. According to the new definition, this devastation can take place in any forest type, including those forests least able to recover from such barbarous cutting. The other half of all cutting can reduce the forest to a scattering of trees that need only be a little more than 4 feet tall. Within a “non clearcut”, 40% of the ground can be devoid of any trees, and in the remaining 60%, as long as some scraggly 4-foot-and-3-inches-high balsam fir or tamarack remain (standing or not), then presto, it’s not a clearcut. And when determining if the embarrassingly low threshold has been met, feel free to include trees up to 25 metres into the surrounding forest, outside of the cut. removal of the overstory” [Matt Miller, Wilderness Coordinator, Ecology Action Centre, personal communication]. Clearly, this definition needs to be revised through a transparent and scientifically credible process. As it stands, it renders the commitment to a 50% reduction in clearcutting meaningless. Conditions that the government might attach to harvesting permits open the door to claims that a company has met restrictions on clearcutting when in reality they have not. The government/NSDNR now say that they no longer need to work on reducing clearcutting to 50% of all harvests because “We have now developed tools that ensure that all harvest treatments are aligned with the nature-based requirements of Nova Scotia’s lands.” That’s a dubious statement on its own, but they still retain the dubious definition cited above, so even if they were keeping track of the extent of clearcutting, the numbers would be next to meaningless. & WHAT IS A PARTIAL CUT? On its Harvest Map Viewer site, NSDNR categorizes harvests on crown land as “Clearcuts” or “Partial Cuts”. Clearcuts are defined by NSDNR as described above. So what is a “Partial Cut”? I could not find a definition on the NSDNR website, but in the Woodbridge 2011 report: Wood Supply Scenarios, Clearcut Harvest Policy Analysis, it refers to partial harvest treatments as selection harvest, commercial thinning and 2 stage shelterwood harvests. Global Forest Watch images NE of Halifax showing Loss of Tree Cover (pink) over intervals given & Gain of Tree Cover (blue) 2001-2012.Most of the Gain (blue) is in land clearcut prior to 2001. Block ID HX060122 is planned cut for 2017. Cutting 2015 and 2016 not shown. So only a Selection Harvest can be called multi-aged management which is what much or most of the public assumes is happening under “Partial Cuts” on crown land. Partial cuts can mean almost anything under the new policy, from cutting one tree to harvests that leave 60 per cent of the area with scattered, chest-high trees, and the remaining 40 per cent totally bare. The policy effectively transfers the ecologically degrading clearcutting attributes of dryness, heat and wind exposure to the partial cut category. Trees left behind are usually low quality. The valuable, longlived tree species that developed over thousands of years and provide excellent wildlife habitats can be completely removed during a harvest under this policy. The new clearcut definition is driving harvesters to cut just beyond the new, deceptive and complicated definition of a clearcut to render it a partial cut instead. It’s playing with words, not better forest policy and offers no help to forest wildlife.